This year’s ADDY Awards presented many awards to SNU students from our graphic design department. The ADDY Awards were on February 18, 2017 at the Chevy Bricktown Event Center. It’s a fancy night of awards given to some very artsy people (picture an Oscars style party, but for advertising). “It’s the fanciest event I’ve ever been to. There were ladies dressed in big Cinderella dresses!” said Becca Cox, a junior, Bronze Award Winner, and scholarship recipient. It is a chance for our SNU students to see other people in their future industry’s work and to showcase their own talents to potential employers. This event is actually less for students and more for businesses. In other words, being able to win an ADDY award at the student level deserves recognition. Of those who are within the graphic design department, there were five award recipients. If you don’t know how an award is won, you’re not alone. As always, that is why I am here to explain the unexplained. There are multiple categories in which to submit a piece of original artwork. The students submitted their best work within multiple categories, which means they could win in multiple categories. The awards include gold, silver, and bronze. There isn’t a limit to how many awards can be given out in a specific category. There could be 12 million gold awards given in a category; that’s illogical and will never happen, but you get my, albeit exaggerated, point. However, what does happen often is that there is no gold, silver or bronze awarded in a category. If the work is not up to par, then it won’t get an award. If the work is amazing, then it will be given the award it deserves. All this being said, the award process shows that our students who won submitted quality work all around. Also, there were four scholarships awarded that night, and two of these were awarded to SNU students J.D. Frees and Becca Cox. In order to get the scholarship, these two had to submit their work and be interviewed. The Best of University Award was given to Morgan (Mosshart) Campbell. This award means she had the highest ranking medals out of everyone who entered from SNU. Those from the graphic design department who won an ADDY award include: Morgan (Mosshart) Campbell, Ashley Grubert, Hannah Cantwell, J.D. Frees and Becca Cox. 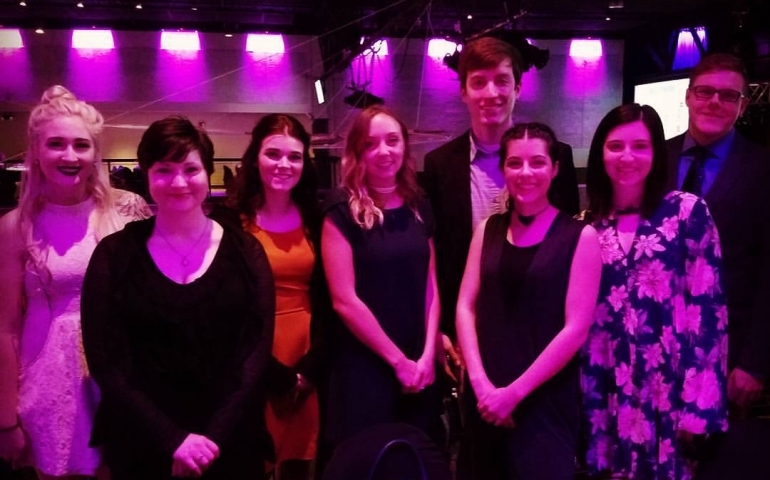 Winning an ADDY Award is a ‘gold’en opportunity for these students trying to get graphic design jobs after graduation, because it is a stellar thing to put on a resume. Also, they are able to network with the businesses represented at the ADDYs. What are we doing in college if not preparing to make money doing what we love? That’s exactly what these awards recipients had the opportunity to do. They were able to brown-nose to their hearts’ desire. At the end of the day, the graphic design department is a close-knit group of creative individuals who deserve recognition. Under the guidance of professors Jim Smith and Phyllis Eagle, the graphic design department continued to show excellence and quality design work. If you see someone who won an ADDY award around campus, take a moment to congratulate them and ask them about the graphic design department! Mady Martin is a Senior Business and Behavioral Science Multidisciplinary major from the “Bethany Bubble.” She studied in Vienna this past semester which explains why freshmen don’t know who she is and she doesn’t know who they are either. She likes Lemonade, both the drink and the Beyoncé visual album. Next PostWhat’s Up With the WiFi?